At DalinYebo, we evaluated palm oil extraction residues and found them to be suitable for the production of furfural, before the rest of the biomass is processed to .e.g. pellets, bio-oils, etc. Why is it not used as feedstock? There are two types of palm oil extraction residues. The kernel shells and the empty fruit bunches (EFB). We found that both of them are suitable for furfural production, but due to their different physical properties, they require different processing methods. Until now, we have not (yet) found an organisation that is interested in exploring this very viable business opportunity. The main reasons given is the absence of working furfural plants that uses palm residues. However, the technology used to prepare and process this feedstock is well understood. 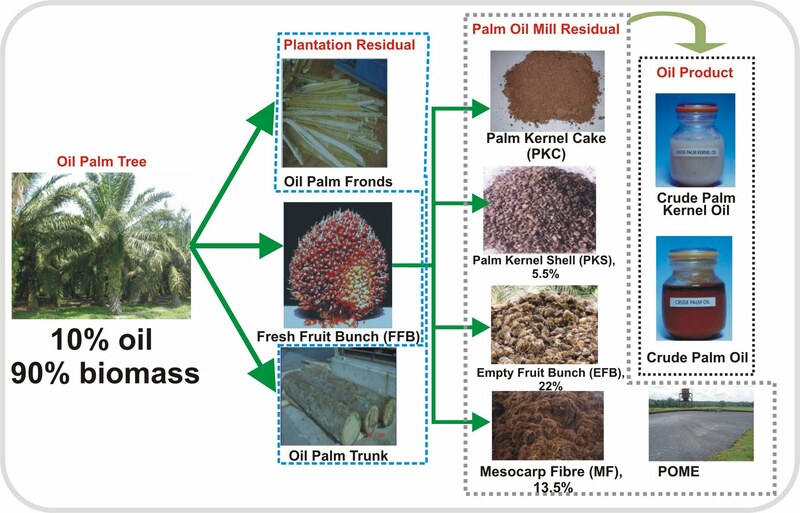 On the basis of our test data, pilot plant and commercial plant data from similar feedstock, we modelled the furfural production from palm residues and found this feedstock to be an economically viable addition to the current processing of palm residues. The residues after furfural extraction can then be further used for e.g. electricity generation, bio-oil production, as we only extract the high-value furfural. Our furfural process integrates especially well into a (planned) CHP facility or could replace the pre-treatment stage of a cellulosic ethanol plant that uses palm oil extraction residues. Furfural production is not rocket science! DalinYebo seeks owners of biomass and investors, who wish to participate in the growing bio-renewable chemical industry, for which we have market access and that can easily be bolted-on to an existing production facility (Contact Us). Not suitable for commercial palm oil production, the Raffia palm (raphia) is the home of the Palmnut Vulture (formerly Vulturine Fish Eagle; Gypohierax angolensis): "The Raffia Palm bears only one crop of fruit in its lifetime of about 20 years, but then it bears all its nuts in one great cluster of up to 6000 nuts with a mass of 1000 kilograms. When the fruit is mature the tree dies, but the single crop gives the birds a plentiful supply of very rich and nutritious fruit. The nuts are about the size of a big hen’s egg, covered with large scales. The birds expertly pull out a fruit, strip off the scales with their specially adapted beaks, and then scrape off the two-millimetre layer of yellow flesh with a sideways movement. After all that effort the bird only gets about one tablespoonful of food, but luckily there is a lot of it." This article is part of a series on "biomass for furfural" production, which provides our clients with updates and analysis on the fundamentals and competitiveness of a variety of feedstock.